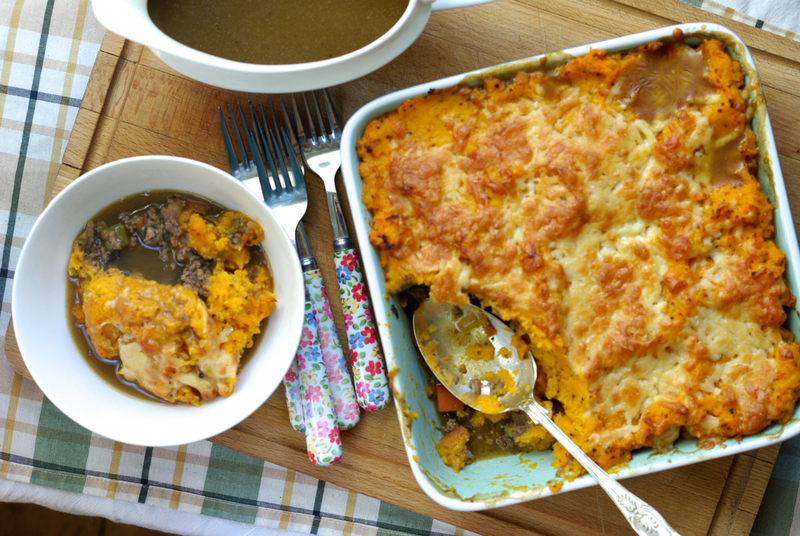 This shepherd’s pie is a great example of how you can easily veg up normal dishes. By adding extra veg to every day food you are more likely to get your kids to eat the blooming’ stuff! It’s the only way that works – in my family anyway! This recipe has sweet potatoes, onion, celery, carrot, mushroom in – that’s 5 veggies. Serve with peas or your kids’ favourite veg and it makes 6. Not bad for a weekday dinner? It is a long cooking time but that’s what gives great flavour. If you can’t face it on a weeknight then what about a Sunday? The other awesome thing about this recipe is that it makes its own gravy! Yes! Confused? Watch the video and you’ll see what I mean! If you don’t like sweet potato – my husband doesn’t – then of course you can use normal potato instead. Chop your veggies as finely as your knife skills will allow! Soften the veggies for at least 15 minutes. You want nice, soft veggies with a caramelised finish. And the herbs and pepper. No salt as stock is salty. Now the flour, stir well and let it cook out for a minute. Make your stock up and add to mixture. Let this cook for 45 mins – 1 hour. Put a pan of boiling water on to boil – add a little salt. Peel and chop sweet potato and pop in when boiling. Boil for 20 minutes until tender. Mash sweet pots with butter, seasoning and mustard. Set aside. When mixture has cooked and veg is soft, see if it needs thickening. If it does, add some cornflour with water or some gravy granules. Let it cook out a little. When you are happy with the consistency, strain the mixture over a jug with a sieve. Hey Presto: gravy! Assemble the pie: tip mixture into pie dish and top with sweet potato mash. Add grated cheese.